Dasha the cat is on Mama duty with a bottle fed mixed breed big cat cub born at a Siberian zoo. Kiara, the newborn liliger at the Novosibirsk Zoo in Siberia is keeping company with a garden variety domestic cat who lives on the grounds of the zoo with her zookeepers petparent. Kiara is the offspring of a liger mother and a lion father, and is the first known liliger. Her Mama was unable to care for her so she is being bottle fed. 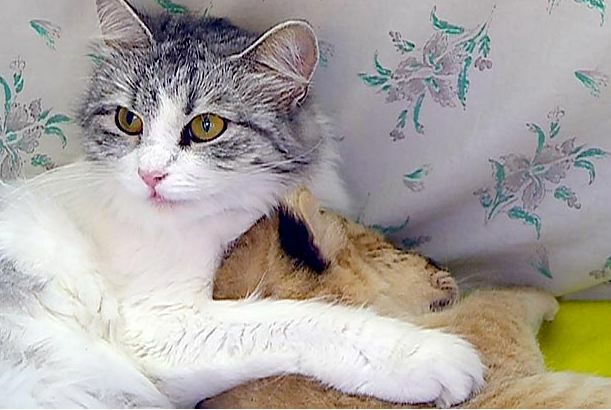 Dasha the cat, who recently had a kitten and is feeling motherly, has adopted Kiara for now and provides her with warm and caring companionship. The liliger has quickly grown to the size of the house cat and will soon be placed in her own enclosure, once she is weaned from the bottle. For now, Dasha provides Kiara with kitty love. Dasha makes an appearance on a video about the baby liliger.